Greetings from OuterSPACE. I have to tell you guys, I have had the most amazing week and I don’t even know how to begin to tell you all about it. First, I want to say that I am having an issue posting my comments on blogger. So for those of you guys that read and comment, I am sorry. I do see them and read them and have all types of witty and thoughtful comebacks but Blogger and Google are conspiring to keep me from posting them lol. So until I get that fixed feel free to talk amongst yourselves orrrr shoot me and email. Just wanted you all to know that I do see and appreciate your feedback. Now back to the greatness. So last week, I told you that my half wife had purchased me a dot.com. Awesome. But this past week, I got some news that put sauce on the awesome. Awesome sauce. Get it? Lol. As you know, I am in this competition with HAY HOUSE and the deadline is fast approaching. I have been looking for an editor for a while now and two weeks ago I found one. She is Atlanta based and is herself a best-selling author. She read my stuff and was blown away. She told me that she thinks once this book hits the stands or the internet it will be a bestseller too. Ya’ll I cried. And not because she gave me a compliment but because this was yet another reminder of how the universe will work with you as long as you work with it. Beyond that, I never considered being a bestseller. I was happy just being in the competition. I mean of course, I want to win. But even that seem(ed) like a long shot. To have her be so positive and so specific about what she liked and the value she thinks this work can bring to the world was incredibly humbling. I am still in shock a bit. Our conversation made me think a bit though…. I thought about Jillian Micheals first. Jillian Micheal’s is fav tv trainer (she works on my favorite show, THE BIGGEST LOSER), she has a saying that she uses on her clients. When they are working out and not giving their all she says they are “phoning it in.” Meaning instead of actually showing up and doing the work, they are doing the equivalent of just calling and talking about working out. After my conversation with the editor, I realized I had been “phoning it in” a little when it comes to this competition. Had I really been working hard enough? Had I been asking friends and family for what I needed? Was I being honest with myself about the effort that I was capable of versus what I was actually doing? I didn’t like the answers to some of these questions. But I liked that I still had time to change the outcome….which brings me to my topic for this week, YOU CAN DO BETTER. When I was having all this internal dialogue about “phoning it in” I also thought about all the other times in my life I had I done just enough to get by? Just what was expected and nothing more. I wondered how many other people felt the same way. And I wondered how much better we could all do it we just….tried. For as long as I can remember, I have worked out in spurts. You know I go to the gym for a week and then the next week some reason; I have less energy and less drive and blah blah. I stop going. And to be completely honest even when I do go, I don’t always push as hard as I can. But this week, I wanted to try something else. I decided to try. Ok so let me back up a bit, because two paragraphs ago I was talking about my book and now I am talking about working out lol. Let me explain that. I know myself really well and I know that for me, when I am procrastinating or avoiding something most times it’s because I am afraid of failure or I don’t have the confidence to complete that task. So I knew before I could wrap my mind around the bestseller thing, I needed to build my confidence. What better way to do that than to overcome a physical obstacle. Enter the Tread.mill again. I love testing myself with physical obstacles because they are great confidence boosters and booty reducers. It’s a win win lol. Plus, I actually enjoy working out, especially when I have my offensive gangsta rap to keep me motivated. I was a lil nervous about this week though because this was “try” week, which meant pushing harder than I normally push. You will recall from last week that I ran for 20 minutes. This week, I wanted to do 2 miles. On Tuesday, I ran for 2.0 miles at 4.4, not bad. So I took it when I was still running. It says 2.26 because I walk for a little bit to warm up. But Wednesday is when the magic happened. I had planned to run the typical 2 miles on 4.4. But after the two miles, I heard myself saying “try” Kenya. So I sped up the pace to 4.6…and I just kept running. 2.5 miles in all. After that, I decided to burn a few more calories on the elliptical. 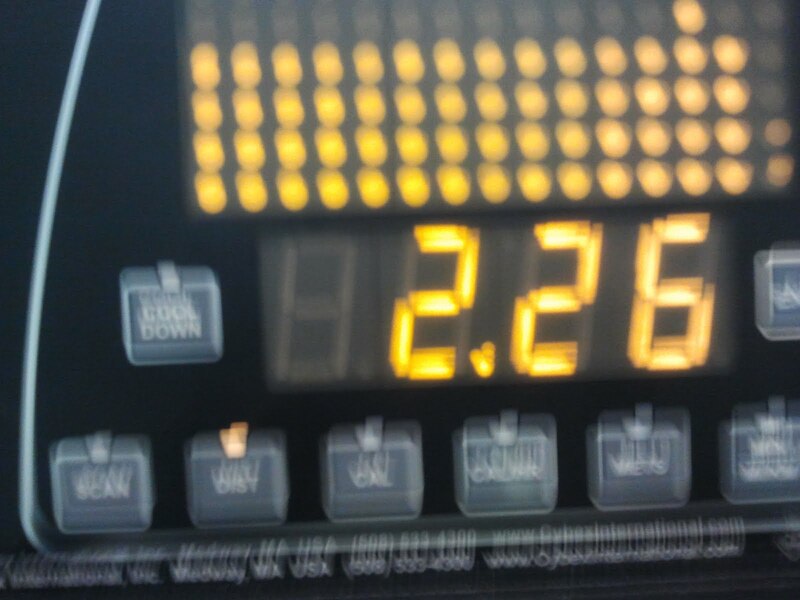 I turned the resistance up to 25, and then took the stairs back to my house. #workbitch!! 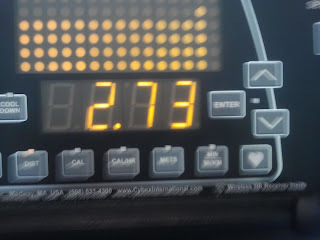 It says 2.73 because I always walk a little before I run. I walked for .23 miles before I ran. Yesterday, my half wife and I did Zummba with Reginald at LA FITNESS and honeeeyyyy let me tell you. Reginald gave me my life and took it back all in the span of one hour, but it felt amazing. I am taking my power back. I am taking it from my job that eats up 50 hours of my week. It does not have the right to rob me of my health. I am taking it back from my addiction- it does not have the power to define my future like it did my past. I am taking it from those pants I busted last week. They can’t make me feel fat anymore. I’m gonna throw them bad boys in the trash when I get in a smaller size next month. But more than anything I am taking my power back from the part of me that doesn’t push or try because she is scared or tired or complacent. Of course, I am still a supporter of setting little goals for yourself but there is something to be said for ambition. If you don’t want more; you won’t get more. Just because someone else is impressed with what you do, doesn’t mean you have done your best. Your best is always a function of your own drive and the limitations you set for yourself. …and I can’t speak for you. But after this week, I know...I can do better! You are such an inspiration! Im glad you're in my life. I always look forward to your tweet about your new blog. Every time I read it I get insipred and gives me life. Woot Woot! You shining Son!